When I had originally planned our stay here, my deluded mum brain bad been hoping that we would get into our room and Evie would fall straight asleep while I caught up with news I’d missed while we’d been away, scrolled through Instagram, called my mum to let her know we’d landed, and maybe even had a little nap myself. A mother can dream right? Once we actually arrived I was under no illusion that she was going to sleep any time soon as she’d just slept for a whole two hours on the plane – which of course I was grateful for. But despite no naps it was still a god send having a room. We were both hot and sticky from the plane ride as well as the unusually hot and sunny weather that both Germany and the UK seemed to be getting. So we jumped in the rain shower to cool off and freshen up. Evie seemed fascinated that she could see me in the shower through the glass window. If you prefer a tad more privacy there is a curtain you can pull across but it was perfect for us as I could keep an eye on what she was getting up to on the other side. We then pretty much spent the rest of our time just relaxing. 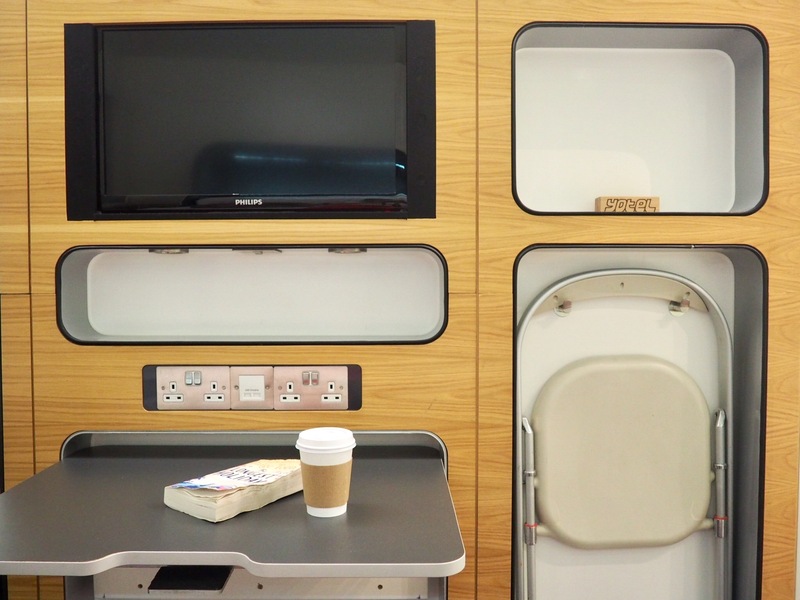 The rooms are fairly small and compact but are really cleverly designed and have a bit of a smart modern tech vibe that makes you feel you’re in your own private cabin on a plane. There is a table and chair workstation that you can get out or fold away giving extra room and suitcases slide neatly underneath the bed. 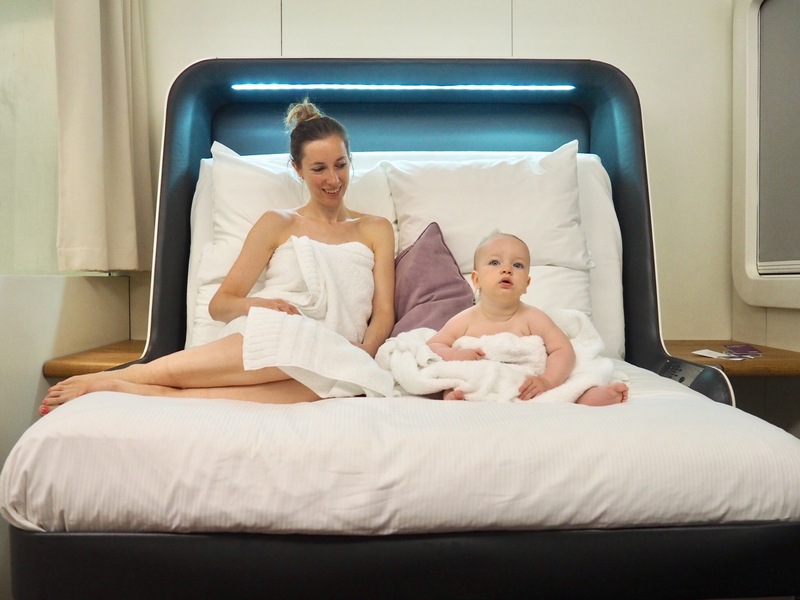 At the push of a button the bed fully reclines to lie flat or moves back up again into an upright position like a super luxurious sofa, leaving lots more space in the room. The adjustable bed doesn’t retract from how utterly comfy it actually is though. I adore the beds at YOTEL as not only are they super cool but they are so so soft and comfy making me feel like I’m sinking into a fluffy cloud. I mean look at the photo below…I don’t think Evie could sink any further into the foam mattress if she tried! We chilled out on the bed in our bath towels with some snacks watching cartoons on TV. I’ve never seen Evie sit so still for so long, so despite her earlier nap she must still have been exhausted from the journey. As was I, so this was the perfect way to relax together at the end our travels. We did venture out of the room to go for a wander at one point because there’s only so long a toddler can chill in the one small room before starting to climb the walls. Or, more likely, before I start climbing the walls. But we didn’t need to go far for entertainment. For starters, being inside Gatwick airport means there are plenty of restaurants and cafes to grab some food from or just have a wander around, Evie people watching and me dreaming of which destination to jet off to next. But just running up and down the corridors of YOTELAIR was fun enough (apologies to any other guests who may have been trying to sleep!) with the lights turning everything bright neon pink which of course was a total selling point for us pink loving girls. 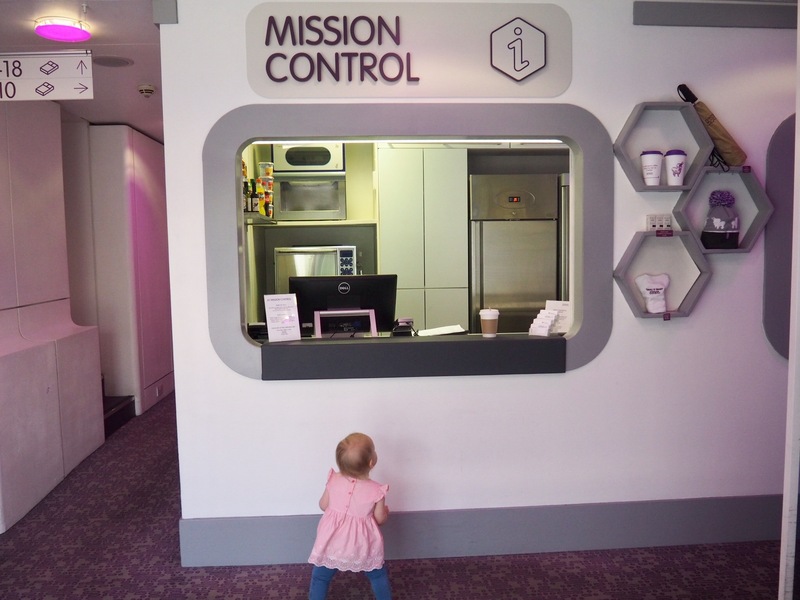 Evie went off in search of Mission Control (aka the front desk) where bottles of water and hot drinks are provided for free so I was able to grab myself a coffee before we headed back to our room. 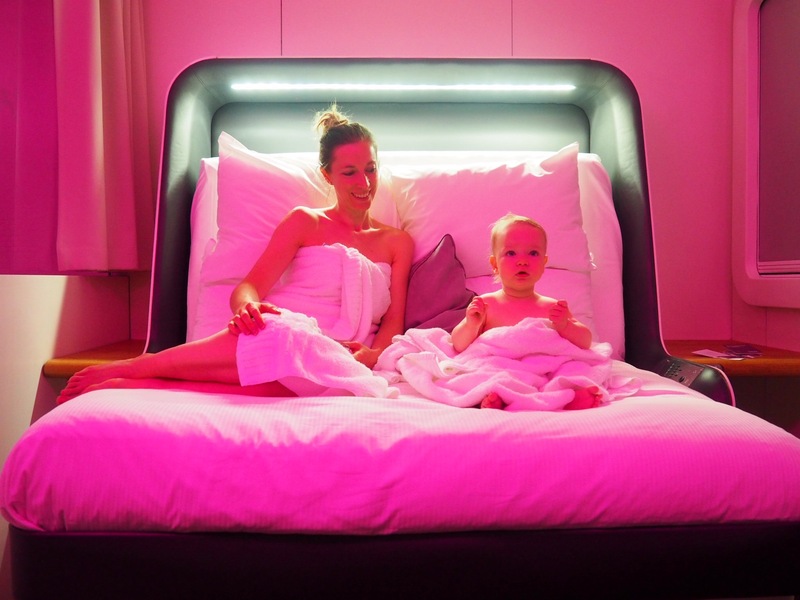 They even sell some smart little YOTEL souvenirs and I was so tempted by the cute baby vest! 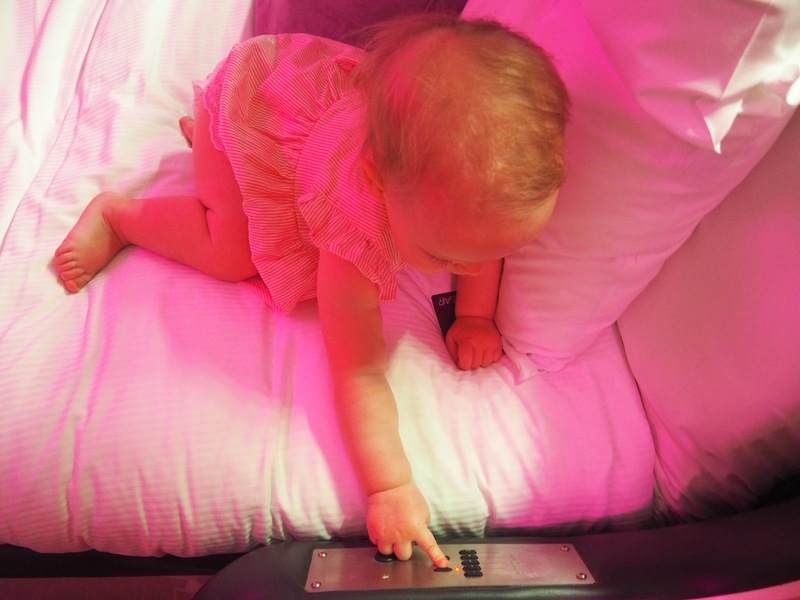 Back in our room and rejuvenated from our chill out session, Evie promptly found the switch to control all the gadgets and had a ridiculous amount of fun moving the bed up and down as well as giving the room some mood lighting with a lovely pink glow just like the corridors outside. When we did actually want to sleep the lights switch off completely and the window blinds pull down so it’s completely dark and silent – just what you want when you need some shut eye before an early flight or on a layover. Hopefully you won’t have any excitable toddlers running up and down outside your room. What more could us girls ask for in a hotel? Bright pink rooms, cool gadgets, free coffee, the softest beds and, most importantly, a plane just a few steps away to whisk us off to any destination we desire. Cheers to that! 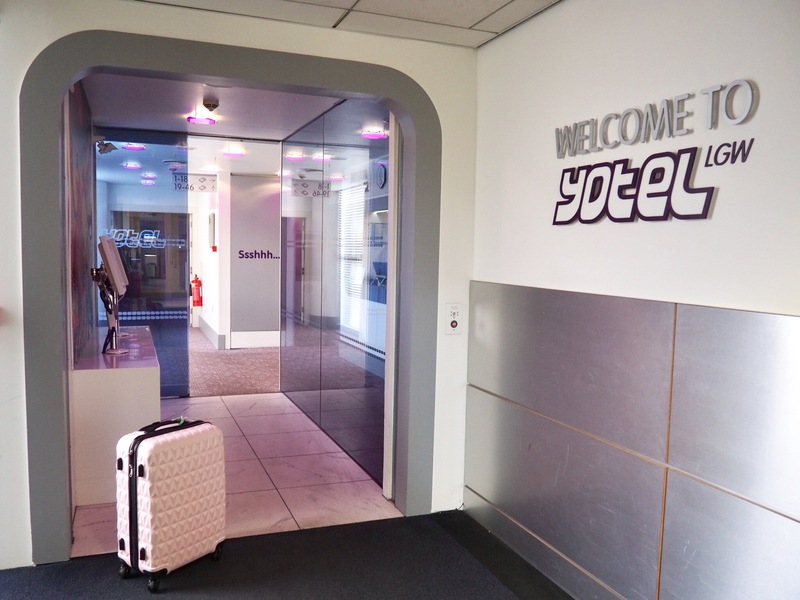 Thank you to YOTEL who hosted our stay at YOTELAIR Gatwick. 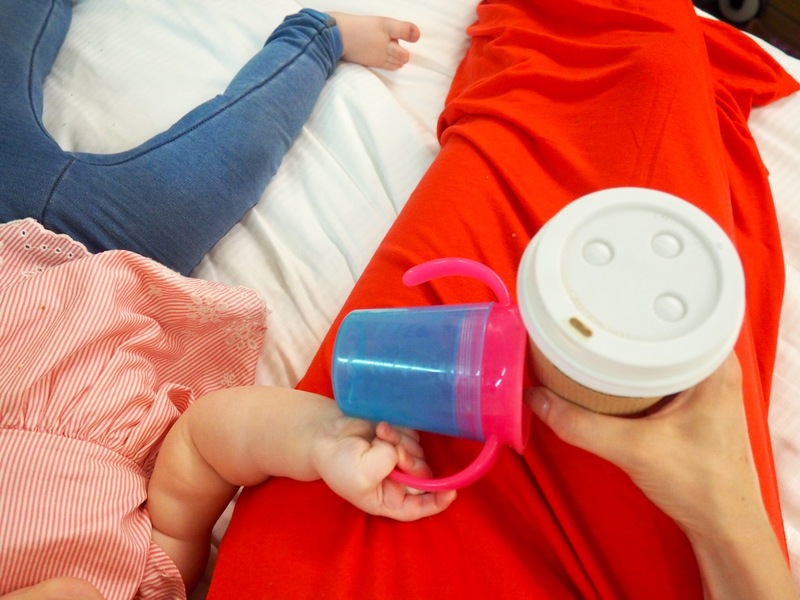 I always have so much fun staying in these hotels and this time Evie did too. I’m sure we’ll be back again on another one of our trips! Aww this is simply the cutest mum-baby pic! I’m thinking abt it and I don’t think I’ve ever stayed in an airport hotel. Yotel looks really cool! Airport hotels are brilliant for overnight stays before an early morning flight. Make everything so much less stressful!